Aomori is both the northernmost prefecture and prefectural capital on Honshu, Japan’s main island. Formerly the main transport hub for accessing Hokkaido, the opening of the Seikan Undersea Railway Tunnel and the rise of cheap domestic flights means that most travellers now bypass the city altogether. Today the city of Aomori is best known for its stunning Nebuta Matsuri festival, which takes place from August 2nd – 7th each year. There are daily parades of huge lantern floats, followed by large taiko drums, musicians and dancers. 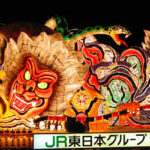 The Nebuta Matsuri, along with with Akita‘s Kanto Matsuri and Sendai’s Tanabata make up the Tohoku Sandai Matsuri; The Three Great Festivals of the Tohoku Region. The small village of Shingo in southern Aomori Prefecture is also known as the burial place of Jesus Christ, according to local legend!